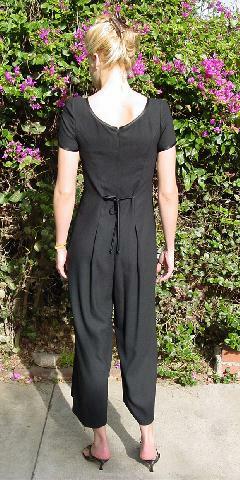 This black jumpsuit has short sleeves and 5 faux satin buttons down the front. It has a rounded scoop neckline, a back 15 1/2" long zipper, and 2 back 18" long satin ties. The neckline and sleeve cuffs are edged in satin. It has great material and styling. A model wore it when she was pregnant. She used it for parties during the holiday season. shoulder to pant leg hem 53"
shoulder to end of sleeve 7"